Black strapping has become something we take for granted, but it constantly demands creative solutions from the development team at Mosca GmbH. A prime example is the drive system for their new flagship product for strapping cardboard. The postman rings and hands over a parcel. The customer takes a pair of scissors and cuts through the black plastic straps, which end up in the trash. Though these straps are something we take for granted and barely notice, strapping (as it is called in the packaging industry) products poses many challenges. For example, when a do-it-yourselfer buys a bundle of roof laths, he is pleased to see that they are bound together tightly. But that is not to be taken for granted; the wood is strapped while still moist after cutting and dries out quickly in a hardware store environment. That results in shrinkage, and then perfect tensioning in the strapping begins to matter. “Our strapping machines are often used in the food industry, where they have to withstand temperatures of minus 20 degrees Celsius in cold stores, or salt water from fish processing,” says Michael Zimmermann, Sales Manager for Germany, Austria and Switzerland at Mosca GmbH. There are 18 drives installed in the machine, but only five different mechanical designs. A solution came into view when Markus Haas became acquainted with the K4 drive regulator at a presentation of the ebm-papst drive portfolio. “It electrified me, and right away I asked the sales representative who had told him what we need. That was exactly the solution we had been looking for.” The regulator provides speed, torque and position control, is configurable and is enabled for communication via RS-485 bus system. The Mosca team’s dream of electronically neutral installation was almost within reach. But a few creative solutions were still needed on the software side. For example, to make the drives work with other components in the same bus system. Since the different components do not communicate identically, a sort of translation is needed for different “dialects” of data transmission. Through an assigned address, every drive always knows whether it or another is being addressed and what is to be done. In a pilot project, the team overcame other obstacles on the way to the perfect drive solution. Armed with that knowledge, they began to work on the implementation of the new UCB. “We can only implement our solutions with our experienced development team,” says Haas. 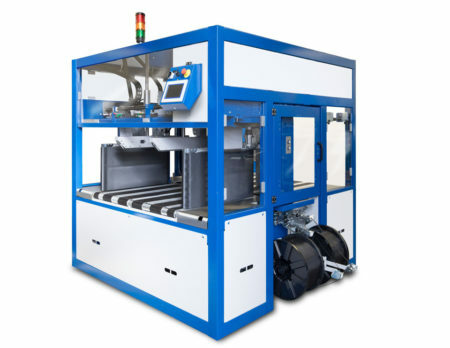 The result simplifies handling in general, and also the machine’s architecture. Function assignments for the drives can be made at runtime, and their integration in the Mosca bus system also enables condition monitoring. In addition, the new UCB’s control box is only a quarter as large as the one on the predecessor machine — with identical functionality. That has many benefits, such as access to the machine. And service calls are reduced to a few hours, as electronics technician Daniel Treu enthusiastically reports: “There are 18 drives installed in the UCB, but only five different mechanical designs. That’s ideal, because a service technician can easily take them along on a service call.” When installed, a drive is automatically addressed, parameterized and given the correct firmware when the machine is switched on; it is automatically customized for the function to be performed. Required fields: Comment, Name & Mail (Mail will not be published). Please also take note of our Privacy protection.